The Gilbert boot range offers lightweight, durable, performance boots that provide stability and support, designed to meet the demands of all rugby players. The range focuses on technological advancements which will benefit rugby players of all levels along with striking designs. A revamp of the Gilbert classic Sidestep, the updated styling provides a quality classical looking, reliable entry level shoe. 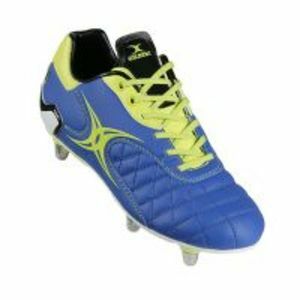 The perfect choice for players looking for a cost effective durable rugby boot.